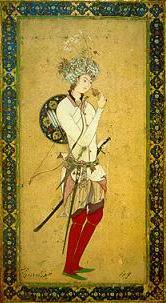 Persian miniature depicting Hārūn ar-Rashīd. Hārūn ar-Rashīd (Arabic هارون الرشيد also spelled Harun ar-Rashid, Haroun al-Rashid or Haroon al Rasheed (English: Aaron the Upright or rightly-guided) (c. 763 – 809) was the fifth and most famous Abbasid Caliph. Ruling from 786 C.E. until his death in 809 C.E., his reign and the court over which he held sway are immortalized in, The Book of One Thousand and One Nights. His competent government was greatly aided by his choice of able administrators. Hārūn is regarded as having been a wise and just ruler, an enlightened patron of the arts who ruled over a generally open and tolerant court. This was a period of flourishing scholarship often referred to as the Golden Age of Islamic Civilization. This was also a time when much Greek learning was being copied into Arabic, much of which, lost to Europe, would later reach Europe via Islamic Spain. Hārūn was the son of al-Mahdi, the third 'Abbasid caliph (ruled 775–785), and al-Khayzuran, a former slave girl from Yemen, a woman of strong personality who greatly influenced the affairs of state during the reigns of her husband and sons. Hārūn was strongly influenced by the will of his mother in the governance of the Islamic empire, until her death in 789. His vizier (chief minister) Yahya the Barmakid, his sons, and other Barmakids were also the main controlling forces in the administration. Yahya's son, Ja'far ibn Yahya, was a great friend of Hārūn's. The caliph enjoyed having his sisters Abbasa and Jafar join him at times of recreation, but Muslim etiquette did not permit them to interact so informally with one another. In order to facilitate their spending time in one another's company, Hārūn arranged for a marriage between his friend and his sister, on the understanding that it was not to be a true marriage, but purely nominal. Yet according to some versions of the story, Abbasa entered Ja'far's bedroom in the darkness, masquerading as one of his slave girls. She secretly gave birth to a child whom she sent off to Mecca. One of her maids, with whom she was quarreling, knew the secret and publicized the scandal. Hārūn heard the story while on a pilgrimage in Mecca and ascertained the tale was probably true. On his return shortly thereafter, he had Ja'far executed, and his body was dispatched to Baghdad. There it was divided in two and impaled on either side of a bridge. It's remains were visible for three years, when Harun, happening to pass through Baghdad from the East, gave command for the remains to be taken down and burned. Upon his death, Ja'far's father and brother were both cast into prison. The aforementioned story is usually regarded as nothing more than fiction. The reason for the fall of the Barkamids was more likely due to the fact that Barkamids were behaving in a manner Hārūn found disrespectful (such as entering his court unannounced) and making decisions of relevance to the state without consulting him first. Hārūn became caliph when he was in his early twenties. On the day of accession, his son al-Ma'mun was born, and another, named al-Amin was born shortly thereafter. The latter was the son of Zubaida, a granddaughter of al-Mansur (founder of the city of Baghdad); so he took precedence over his older brother, whose mother was a Persian slave-girl. Hārūn began his reign by appointing very able ministers, who carried on the work of the government so well that they greatly improved the condition of the people. It was under Hārūn ar-Rashīd that Baghdad flourished into the most splendid city of its period. Many foreign rulers paid tribute to the caliph, and these funds were used for architecture, the arts, and a luxurious life at court. 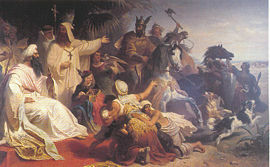 Julius Köckert's painting of Harun al-Rashid receiving the delegation of Charlemagne demonstrates the latter's recognition of Hārūn ar-Rashīd as the most powerful man of his culture. Hārūn built a palace in Baghdad, far grander and more beautiful than that of any caliph before him. He established his court and residence there and lived in great splendor, attended by hundreds of courtiers and slaves. Later in his life, he moved and set up his court at Ar Raqqah, in the north of Syria. He did this ostensibly to hold what was perceived as a disloyal Syria in check, in spite of his attachment to Baghdad, where he never actually resided again. Hārūn ar-Rashīd was very anxious that his subjects be treated justly by the officers of the government, and he was determined to hear out any complaints. He is said to have occasionally disguised himself at night and gone through the streets and bazaars, listening to the talk of those whom he met and asking them questions. In this way he learned whether the people were contented and happy. Hārūn was a great patron of learning, poetry, and music. He was a scholar and poet himself and whenever he heard of learned men in his own kingdom, or in neighboring countries, he is said to ahve invited them to his court and treated them with respect. The name of Hārūn, therefore, became known throughout the world. He had diplomatic relations with China and with Charlemagne. It is said that a correspondence took place between him and Charlemagne and in 802, Harun sent him a present consisting of silks, brass candelabra, perfume, slaves, balsam, ivory chessmen, a colossal tent with many-colored curtains, an elephant named Abul-Abbas, and a water clock that marked the hours by dropping bronze balls into a bowl, as mechanical knights—one for each hour—emerged from little doors which shut behind them. The presents were unprecedented in Western Europe and may have influenced Carolingian art. Charlemagne was awarded permission to send financial aid to the Christians of Palestine. On the one hand, Hārūn demanded that Christians wear distinctive clothes but on the other he employed Christians and Jews in significant positions and is said to have loved his Christian physician, Gabriel Bukhtichlo, as if he were a member of his own family. In military matters, Hārūn was an excellent soldier and demonstrated this ability at a young age when his father was still caliph. He later commanded an army of 95,000 Arabs and Persians sent by his father to invade the Eastern Roman Empire, which was then ruled by the Empress Irene. After defeating Irene's famous general, Nicetas, Harun marched his army to Chrysopolis (now Üsküdar in Turkey) on the Asiatic coast, opposite Constantinople. He encamped on the heights in full view of the Roman capital. The Empress saw that the city would certainly be taken by the Muslims. She therefore sent ambassadors to Harun to arrange terms; but he sternly refused to agree to anything except immediate surrender. It is reported that then one of the ambassadors said, "'The Empress has heard much of your ability as a general. Though you are her enemy, she admires you as a soldier.' These flattering words were pleasing to Hārūn. He walked to and fro in front of his tent and then spoke again to the ambassadors. 'Tell the Empress that I will spare Constantinople if she will pay me seventy thousand pieces of gold as a yearly tribute. If the tribute is regularly paid, Constantinople shall not be harmed by any Muslim force.'" The Empress agreed to these terms. She paid the first year's tribute; and soon the great Muslim army set out on its homeward march. The tribute of gold that the Empress Irene agreed to pay Hārūn was sent regularly for many years. It was always received at Baghdad with great ceremony. The day on which it arrived was made a holiday. The Roman soldiers who came with it entered the gates in procession. Muslim troops also took part in the parade. When the gold had been delivered at the palace, the Roman soldiers were hospitably entertained, and were escorted to the main gate of the city when they set out on their journey back to Constantinople. As soon as Hārūn had read these words, the ambassadors threw a bundle of swords at his feet. The caliph smiled, and drawing his own sword, or scimitar, he cut the Roman swords in two with one stroke without injuring the blade or even turning the edge of his weapon. Then he dictated a letter to Nicephorus, in which he said: "Hārūn ar-Rashīd, Commander of the Faithful to Nicephorus, the Roman dog: I have read your letter. You shalt not hear but you will see my reply." Hārūn was as good as his word. He set out with a large army intent on punishing the emperor. He laid siege to Heraclea, a city on the shores of the Black Sea, and in a week forced it to surrender. Nicephorus felt forced to agree to pay the tribute. However, scarcely had the caliph reached his palace in Baghdad when the emperor again refused to pay. Hārūn, consequently, advanced into the Roman province of Phrygia in Asia Minor with an army of 15,000 men. Nicephorus marched against him with 125,000 men. In the battle which followed, the emperor was wounded, and 40,000 of his men were killed. After this defeat, Nicephorus again promised payment of the tribute, but once again failed to keep his promise. Hārūn vowed that he would kill the emperor if he should ever lay hands upon him. But as he was getting ready to march once more into the Roman provinces, a revolt broke out in one of the cities of his own kingdom; and while on his way to suppress it he died from a chronic illness. He is said to be buried in Tus. 766: Hārūn is born, the son of Caliph al-Mahdi and the Yemeni slave girl al-Khayzuran. 780: Hārūn is the nominal leader of military expeditions against the Byzantine Empire. 782: Hārūn is nominal leader of a military campaign against the Byzantine Empire reaching as far as the Bosporus. A peace treaty is signed on favourable terms. Harun receives the honorific title ar-Rashīd, named second in succession to the caliphal throne and also appointed governor of Tunisia, Egypt, Syria, Armenia and Azerbaijan. 786: Hārūn's brother al-Hadi dies under mysterious circumstances—it was rumored that his mother al-Khayzuran was responsible. Hārūn becomes the new caliph and makes Yahya the Barmakid his Grand Vizier—but al-Khayzuran exercised much influence over the politics. 789: Al-Khayzuran dies, leaving more of the effective power in the hands of Hārūn. 791: Hārūn wages war against the Byzantine Empire. 800: Hārūn appoints Ibrahim ibn al-Aghlab governor over Tunisia, making him a semi-autonomous ruler in return for substantial yearly payments. 803: Yahya dies, and even more of effective power comes in the hands of Hārūn. 807: Hārūn's forces occupy Cyprus. 809: Dies while traveling in the eastern parts of his empire. al-Amin succeeds him as caliph. Hārūn is widely considered the greatest of the Abbasid caliphs, presiding over the Arab Empire at its political and cultural peak. Consequently, Islamic literature (the work of ibn Kather, for example) has raised him to the level of an ideal figure, a great military and intellectual leader, and even a paragon for future rulers to emulate. His best-known portrayal in the West, in the stories of the Thousand and One Nights, has little basis in historical fact, but does show the mythic stature he has attained over time. Future U.S. President Theodore Roosevelt, when he was a New York Police Department Commissioner, was called in the local newspapers "Haroun-al-Roosevelt" for his habit of lonely all-night rambles on the streets of Manhattan, surreptitiously catching police officers off their posts, sleeping, or otherwise engaged in restaurants or brothels. The character Jafar, in Walt Disney's animated motion picture, 1992's Aladdin, is vaguely based on Hārūn's vizier's son. The comic book The Sandman issue 50 featured a story set in the world of the Arabian Nights, with Hārūn ar-Rashīd as one of the protagonists. The story, entitled "Ramadan," is included in the collection The Sandman: Fables and Reflections. The two protagonists of Salman Rushdie's 1990 novel, Haroun and the Sea of Stories, Haroun and his father Rashid Khalifa were clearly named after the Caliph. Hārūn ar-Rashīd figures in the third chapter of James Joyce's Ulysses, in a dream of Stephen Dedalus, one of the protagonists: "Wait. Open hallway. Street of harlots. Remember. Haroun al Raschid. I am almosting it." Harun al-Rashid is also celebrated in the 1923 poem by W.B. Yeats, The Gift of Harun al-Rashid, first published as part of The Dial in 1924. In Quest for Glory II, the sultan who adopts Devon Aidendale as his son, is named Hārūn ar-Rashīd. He is often seen prophesizing on the streets of Shapeir as The Poet Omar. Henry Wadsworth Longfellow wrote a poem which started "One day Haroun Al-Raschid read/A book wherein the poet said/Where are the kings and where the rest/Of those who once the world possessed?" This page was last modified on 7 February 2014, at 15:37.